Recently Oppo has launched the R15 and R15 Plus models in China. 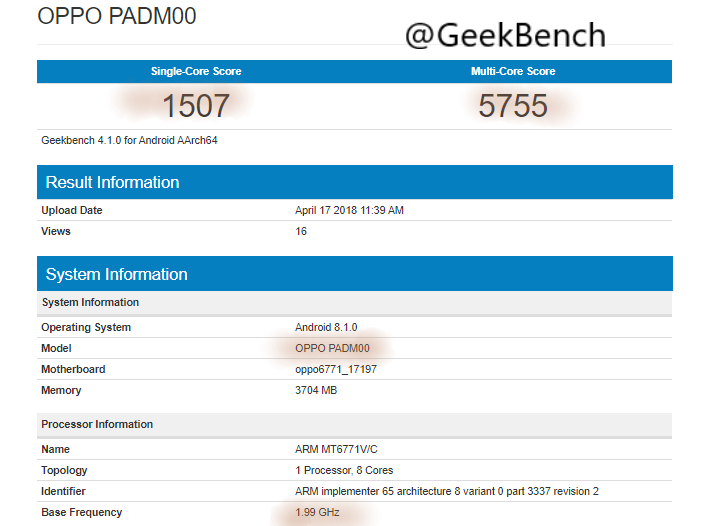 Now the Oppo's new upcoming device has been listed on the Geekbench website named the Oppo A3 with the model name Oppo PADM00. 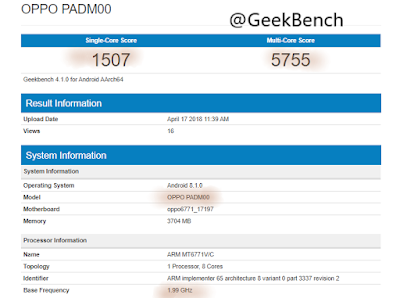 The smartphone runs on Android 8.1 Oreo OS and is powered by a 1.99GHz MediaTek Helio P60 Chipset Processor. The Oppo A3 has 4GB RAM with 64GB ROM, which can be extended using a MicroSD card slot. It is expected that the device will feature a 3300mAh battery which lasts for a day and will have Face detection for unlocking the device. The OPPO A3 smartphone is expected to have an 8MP front-facing camera for selfies and video calling and have a 16MP rear-facing camera for capturing the memories. The device will come with a 6.2-inch IPS LCD screen display with a 1080×2280 pixels Full HD+ resolution. There is no official announcement regarding the launch.